A local television current affairs program ran a story this week about a Brazilian faith healer named John of God. Actually, two competing programs ran stories about this charlatan on different channels. I was interviewed for one of the shows, at very short notice. I was first contacted at about 3:30 when I was with a client and the interview was recorded between 4:30 and 5:00 for a show going to air at 6:30, so I had no time to collect any relevant material to show the reporter. What I heard was enough, however, to tell me that we were looking at fraud, because all the signs were there. The one puzzling matter, though, was that there was a woman claiming that this man had cured her lung cancer, and she had before and after x-rays to prove it. I didn't get to see the x-rays until the show went to air, and the pictures below are taken from a tape of the show. I'm not a radiologist, but to my layman's eye these did not look like scans of the same part of the body. I asked some doctors to comment and they agreed with me. 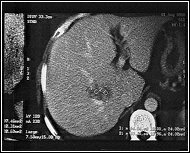 Not only that, but they all agreed with each other that the "before" scan was of a liver, not a lung. So much for proof of cured lung cancer. 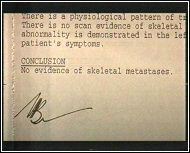 The radiologist's letter was also included in the program as evidence of a cure, but it is undated and talks about cancer in bones, not lungs. Before - but it's a liver! 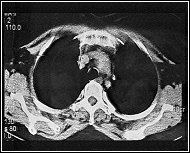 After - is this lung the same liver? 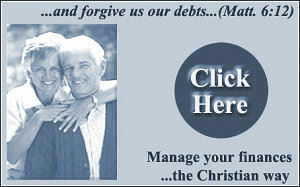 I think I may have found the most offensive web site in the world. It is called the National Child Abuse Defense & Resource Center, and its reason for existence is to deny the reality of Shaken Baby Syndrome and other forms of child abuse and to offer support and succour to anyone accused of child abuse. To the mad woman who runs it, Barbara Bryan, there seems to be no possibility that anyone could harm a child, except the evil vaccine manufacturers of course. In her insanity, she says things like "physics-based research in varying disciplines" shows that "SBS theory does not comport with laws of nature". What is "SBS theory"? It is not a theory that shaking a child is harmful, it is not a theory that certain damage to children is caused by rapid acceleration. The laws of nature might be different in her universe, but out here in the real world violence kills children. How could anyone hate children as much as vermin like Bryan does? How can she look in a mirror without vomiting? The ludicrous death sentence hanging over Amina Lawal has been quashed. She was the Nigerian woman sentenced under Sharia law to death by stoning for having a baby. It seems that Islamic law isn't as certain as it was about this sort of thing, but it is unfortunate that the appeal was granted by a religious court rather than a civil court. The latter could have made the point that there is no place for religious bigotry and its consequences in a civilised society. Still, it's a start. You can read the Amnesty press release here. 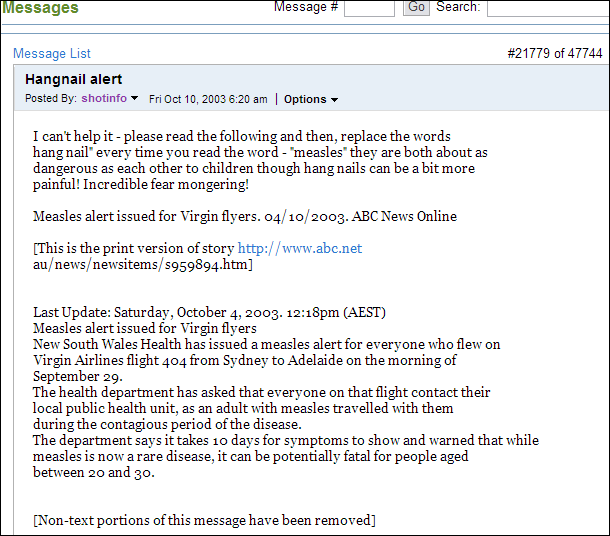 is there anyone, like a pro vaccination person i can email about why they dont make vaccinations compulsory, dont worry i will never vaccinate my child i am just curious as to why they keep lieing about there safty, appealing to the uneducated, and using childeren as poker machines, while the babies themselves have no say in the matter, lets face it there is no polio, no dipthria and hardly any tetnus, and manigercoccal well thats not 90 % effective as they so claim either!!!!!! A year ago, 202 people were murdered in a nightclub in Bali. This was done by madmen who believe that their religion gives them the right to kill members of other religions. You would hope that an incident like this would help the world to see that artificial divisions of humanity along superstitious lines are meaningless, but unfortunately you would be wrong. As an example, the President of Indonesia was not going to go to the anniversary memorial ceremony because her attendance might offend Hindus, who do not believe in commemorating the dead. The iconic image most often associated with the Hindu religion shows the goddess Shiva supported by a pedestal representing enlightenment. She is stamping on a figure which represents ignorance and holding one of her hands in a position which means "do not be afraid". It is unfortunate that in reality, religion often rejects enlightenment and promotes ignorance and fear. As it happened, representative of Indonesia's five major religious groups participated in the memorial service, doing what religion does best - offering comfort. It was encouraging that they could agree on a common cause. Two hundred and two human beings died in the outrage in Bali, and we should remember them as humans. Not Christians. Not Hindus, Not Muslims. Not Buddhists. Not atheists. People. I was last in Las Vegas over twenty years ago, and the highlight of the trip was seeing Siegfried and Roy. We were only in town for a few days and we picked this show at random without knowing anything about the performance other than that it was a magic show of some kind. I still rate it as one of the best things of any kind I have ever seen on stage. I was determined to see the show again when I visit Las Vegas for Randi's Amazing Meeting next year, but it now looks like this will not be possible. Last Friday night Roy Horn was attacked by one of the white tigers which make the show so special and spectacular. He is still in a critical condition in hospital, although his friends have said that he is improving and can communicate through small hand movements. Nobody is really sure what happened, but it appears that Roy fell over and the tiger's instincts took control. The biggest difference between honest magicians like Siegfried and Roy and charlatan magicians like Uri Geller and John Edward is that the honest magicians make no secret of the fact that what they do is the result of practice, skill, trickery, and, in the case of Roy, a lot of time spent training the animals. Nobody in the audience thought, or was even encouraged to think, that Roy moved tigers around and made them appear and disappear by using the power of his mind or other supernatural means. (Of course he did use his mind while planning his work and designing the tricks. This is not what most people mean by "mind power".) I don't know how he could snap his fingers and make a tiger appear in the audience, and I don't really want to know. I do know that I would enjoy the experience a lot less if the man on stage was pretending to have outside assistance from forces unknown to science or reason. Roy's accident reminds us of how fragile and unpredictable life can be. My thoughts are with him, his friends and colleagues. I hope that the doctors can work their own particular kind of magic over the next few weeks and months and get him back on stage to thrill us again by doing impossible things with his improbable assistants. Some time this weekend the Pope will beatify Mother Teresa, moving her one step closer to sainthood. 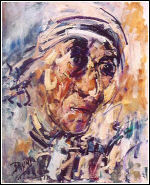 To become a saint requires two verified miracles, but Mother Teresa only has one attributed to her so far. This was the case of a woman with ovarian cancer who got better after praying for Mother Teresa's help. The problem that the Vatican has here is the same as the alternative cancer curers have when they produce someone who is cured but has been having conventional medical treatment. It is impossible to prove that the cure was the result of anything other than the treatment received from the doctors, and the fact that this lady prayed and got better doesn't mean that it was the prayer which did the job. The doctors who treated the woman are understandably upset that their work is being seen as secondary to some supernatural interference, and one has pointed out that Mother Teresa's real-life work should be enough to prove her worth without any need for her to be given the credit for his work too. The story of Mother Teresa's beatification is another example of the gulf between religion and real life. She was able to get a Nobel Prize based on what she did that was possible (don't write in, I know the Peace Prize people can get it wrong sometimes - Kissinger, Arafat, ...) but to become a saint she has to be proven to have done the impossible. It is this sort of paradox which makes thinking people reject religion, because it is always asking you to believe impossible things. It has always puzzled me how someone with the obvious intellectual ability of Pope John Paul II could ever have got into the job he has. He has recognised this himself, and a few years ago wrote a paper called Faith and Reason which attempted to reduce his cognitive dissonance by identifying and reconciling the realms which are the appropriate domains of belief and knowledge. It was cleverly written and well argued, but ultimately it failed to make the case for the need for a world which can exist without evidence for that existence. I wonder if the next Pope will even bother to address the question. Fifty years ago this week, on October 15, 1953, an above-ground atomic bomb test was carried out at Emu Junction in the middle of Australia. This test was not done by Australian scientists or as part of Australia's defence program. It was a test of a British bomb, and it was about two-thirds the power of the one dropped on Hiroshima a few years before. Apparently it was more convenient for the British government to test such weapons in Australia rather than in, say, Sussex. The history of British nuclear testing in Australia is one of deceit, callousness and disregard for the local population on a scale which would defy belief if it had not been fully documented. (A Royal Commission into the tests showed that much of the documentation was withheld from the Australian government and people so that lies could be told and promises could be broken.) One of the disgraces was the way that the Aboriginal inhabitants of the area around the test sites were ignored and subjected to the effects of fallout from the bombs. Warning signs in English are not very useful to people with no written language at all. The fallout from the Totem 1 test caused sickness and death up to 250 kilometres away, well outside the restricted "test zone". In an amazing exhibition of political insensitivity, the area occupied by one of the groups worst affected by the tests in the 1950s and 1960s has been suggested as a suitable site for a radioactive waste dump. I should make it clear that I have no serious objection to nuclear waste being buried in Australia. The place is very old and very stable geologically, providing an almost perfect environment for burial as a form of disposal, and there are techniques such as the Australian-developed synroc which can immobilise the waste once it is buried. I also believe that nuclear power generation is a viable and environmentally-friendly option for meeting electricity needs, despite the lies of people who deliberately conflate nuclear power with weapons. Disposal of wastes is a problem for nuclear power generation, but it is a problem with a solution. Australia is a very big place with very few people. Surely somewhere can be found for a radioactive disposal facility that isn't in the immediate backyard of people whose experience is that the last time anyone from the government came around using the word "nuclear" this was followed by many seasons of hard rain, pestilence, death and sickness. The local indigenous people have a right to be distrustful and wary. It would make sense to recognise these fears and the reasons behind them and look for somewhere else to drill those very deep holes. Read some more about this here. Suggestions so far have mainly been to use colloidal silver (both orally and topically), plus one person who offered a purge recipe to "warm the cervix". My favourite, however, has to be : "Something that's about 100% effective is ozone insufflation". In the real world, something which is "about 100% effective" is a simple surgical procedure carried out under local anaesthetic.We are talking about a deadly disease here, one which kills countless women worldwide each year. When Lisa dies, nobody will attribute the death to quackery. Las Vegas magician Roy Horn is still in a stable but critical condition in hospital following an attack by a tiger. In one of those marvellous procedures which real doctors can do and alternative medicine charlatans can only dream about (or deride), the surgeon removed about a quarter of Roy's skull to allow room for the swelling of his brain. The skull fragment is being stored within Roy's body until the time comes to put it back where it belongs. This is real magic. Australia i s one of only a handful of countries which have maintained true democracy since the start of the twentieth century. Everyone except committed lunatics and felons can vote and have been able to do so since federation. (Aborigines had voluntary voting up until 1967, when a referendum corrected some nineteenth century thinking and made them full citizens; women have been able to vote since the first elections were held.) Our constitution guarantees freedom from religion, and is worded to remove the weasel room in the establishment clause of the US constitution. Elections are peaceful and the results are usually correct, although about half the electorate always feels cheated for a short time after polling day. Our politicians are accessible, friendly towards the voters, and usually get around without much obvious security and fuss. (I met the second-most senior member of my state government at a function on Friday. 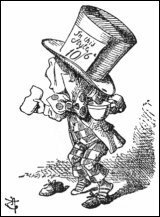 He appeared to be travelling with an entourage of one (himself) and was most impressed by the ability that some skeptics have to bend spoons.) A couple of visitors to Australia this week reminded us how fragile and disposable the trappings of democracy are and that whoever said that the price of liberty is eternal vigilance was right. The President of the United States, Mr George W Bush, paid us a flying visit on Thursday. Australia derives much income from its tourist industry, but it is possible that the 650 (that's six hundred and fifty!) people which Mr Bush brought with him may distort the inbound tourism statistics. All of those people must have been necessary as Mr Bush had three very onerous duties to perform. He addressed a joint sitting of the Australian House of Representatives and the Senate (an event to which the public were not invited), he laid a wreath at the Australian War Memorial (an event to which the widow of the dead soldier being specifically honoured was not invited), and he went to a barbecue (an event to which the press and the leader of Her Majesty's Loyal Opposition were not invited). History was made when Mr Bush spoke to the Parliament, because this was the first time in Australia's history that a session of parliament had been closed to the public. If Mr Bush is so frightened of being attacked, assassinated or exposed to protestors in a friendly country it is a wonder that he can go anywhere at all. Perhaps the 650 people are there to create a huge human shield. Whatever the reason, it is outrageous that the Australian public should be prohibited from using the public gallery in what, in a democracy, should be the most public place of all. It is equally outrageous that an elected Australian Senator should be fobbed off with a trite answer from the President when he asked a perfectly reasonable question about Australian citizens who are being held uncharged and untried at Guantanamo Bay. Australia and the United States are friends, and I would like things to stay this way. It should not be necessary to go into obsequious, brown-nose, cringing mode just because someone important is visiting. (A person very close to the Throne of England has been in Sydney this week for the Rugby World Cup. Nobody took much notice.) In Mr Bush's speech he referred to the Australian expression "fair dinkum" and showed that he had no idea what it meant. This is forgivable in a stranger, but the evidence suggests that the people who run our democracy here have forgotten what it means too. Still, things could be worse - Brother Jeb could be coming here to tell us how to run elections. The next day we received a visit from the Chinese President, Hu Juanto. Here was a serious case of not understanding how the real world works. In another break with the traditions of government Mr Hu also got to address Parliament, despite a long-standing convention that only the leaders of democracies get to speak in the temples of democracy. Still, conventions and traditions can be cast away when 30 billion dollar trade deals are being mentioned. It has been a long time since the government-sanctioned murders in Tiananmen Square but it seems that the Chinese have learned nothing. In the week leading up to Mr Hu's speech, the Chinese embassy had been on the phone to Australian media outlets asking them to not print any stories about any protests. At the last minute, Mr Hu refused to speak at all unless two people who are known to be involved with the Tibetan freedom movement were removed from the public gallery (at least the public could be there this time). The response of the Speaker of the House should have been a two-word phrase beginning and ending with the letter "f", but instead another folding and brown-nosing happened and the two guests of a Senator were ejected. One day someone will explain to the Chinese why their attitude to people's rights is so offensive, but I guess that day will have to wait until they don't want to buy billions of dollars worth of natural gas. Before the start of today's Indy car race at Surfers Paradise, in Queensland, in Australia, a young lady got up with microphone in hand to sing the National Anthem, as is traditional at such events. When she started to sing I was somewhat surprised to hear that the first line of the song was not "Australians all let us rejoice", but "Oh say, can you see by the dawn's early light". I know that champ car racing is an American thing, but surely there is some protocol about which song gets sung and when it gets sung. Kathleen Folbigg, who murdered the four children in the picture, was sentenced to 40 years in prison this week. I am still amazed that her defence lawyers did not call on Australia's coterie of expert witnesses who will swear in court that infant deaths can never be caused by violent action of the parents but must always be caused by vaccines. Where were Viera Schiebner, Archie Kalokerinos and Bronwyn Hancock when they were needed? Perhaps this case was too blatant even for them, but I have been told that it is impossible to shake a baby to death. Could it be that when the death toll rises beyond one or two they realise that the public might see through their charade of using these deaths to further their insane agenda? There has been a major infrastructure upgrade at Northmead Technology Park, home of the RatbagsDotCom headquarters. There are new computers, new software, new operating systems, new mobile phones, new almost everything. Of course, nothing now works as it should and new surprises are discovered every day. The new version of FrontPage broke a whole lot of automatic processes which are vital to the maintenance of this site and which which worked quite well with the previous version. I think I have found all the problems now, but as I lack psychic powers there might be little time bombs that are still waiting to go off. A nice example of change for the worse appeared in the method used to put the footer on each page of the site. At the bottom of most pages is a block with a link back to the front page, a PayPal button, copyright notice and email link. This used to contain the date that each page was last updated, but publishing from the new version of FrontPage changed that to show the date that the footer template was last changed! Really useful information. To add to my woes the link checker program told me that all the internal links on the site to commentary pages were broken, but this seems to be a problem with the way Windows XP passes hyperlinks to crawler programs if they are formatted in a particular way on the web page. If Bill Gates didn't give so much money for vaccination campaigns I would have nasty things to say about him, his company, and the software they write. There are various industry bodies and consumer deception organisations in Australia devoted to spreading lies, deceptions and untruths about alternative medicine and quackery. They all claim to be opposed to outright medical fraud, but their actions when the house of cards is threatened tell the truth about their real objectives. An example was the hysterical response to an attempt to set up a committee to investigate the most egregious quackery, where the reaction from the industry was not to encourage the weeding out of dangerous and insane practices but to start immediate ad hominem attacks on anyone who was doing any investigating. Until now there has been no body or organisation with the specific objective of countering quackery. Groups like the Australian Skeptics have done a lot, but they have other agendas and other interests which compete for time and resources. The Australian Council Against Health Fraud has been set up to focus exclusively on the protection of consumers against the sorts of "alternative" medical products and practices which endanger lives, impoverish people, and distract people from seeking real medical advice. ACAHF is not opposed to alternative medicine as such, only to that part of it which is scientifically unsupportable and unproven. Anything which is safe and which can be shown to work is not a problem or a concern for ACAHF. Unfortunately, too much of it is either unproven or cannot ever be proven to work, and much of it is actually dangerous. The ACAHF is brand new (it has only existed as a legal entity since October 20) and will gradually come to life over the next few weeks. There will be a web site online shortly which will describe coming activities and education programs and offer membership and sponsorship opportunities. Details will be announced here as soon as the site is operational. I encourage everyone who has an interest in defeating quackery to help ACAHF to bring some sanity to the debate about alternative medicine.